Everyone knows that having a clean, functioning gutter system is an important part of maintaining any property. Fall is the season when gutters are cleaned out in preparation for the rainy or snowy season ahead. If the rainwater doesn’t flow properly through the gutter and downspout system, costly repairs can add up from rainwater damage or freezing. Following some simple steps can help you safely and successfully clean your gutters. Let someone know you will be using a ladder to work on your building’s roof or gutters. Use a safe and sturdy ladder, like fiberglass or aluminum. 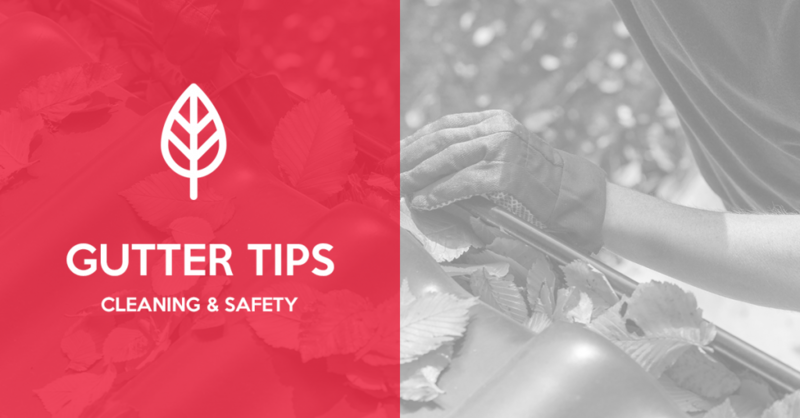 Look for one with a small shelf strong enough to hold a five-gallon bucket to collect gutter debris, and make sure to secure the bucket with a lanyard. When opening up a step ladder, make sure the extension-hinge arms are fully extended and locked in place. Try using a garden hose with a pistol-grip trigger spray nozzle. Pick up a plastic Gutter Scoop. These are excellent tools for this job and can be purchased at most hardware stores. Stay away from using a metal scooping tool as they can damage the bottom of the gutter and seams. Make sure to wear gloves. Gloves can help protect hands against harmful debris and bacteria, as well as cuts from a gutter’s sharp edges. Wear eye protection to prevent dirt or debris from entering your eye. Consider wearing rubber-soled shoes. These shoes provide good traction and can prevent a slip and fall. Beware of powerlines and cables. Conduct a visual inspection of the electrical cable where it connects to the roof. If the cable appears to have damage, do not attempt to repair it. Instead, call a licensed professional electrical contractor to fix it. Do not attempt to clean out the gutters until the damaged wires are secured. Be sure to unclog downspouts. Make sure they’re pointed in the proper direction and away from your property.